Reserve Scenic Mountain Pool Today! Me and my family came to stay in here for the first time last weekend, and OMG!!!! The. Scenic Mountain Cabin was everything that was shown on the pictures. It was very relaxing and peaceful. Only thing that was a nuisance was the ladybugs they were everywhere. It was my daughter's 13th birthday sleepover and she said she had the best birthday ever..We'll most definitely be back.Thanks CabinUSA for such a beautiful first time experience with our visit to a cabin in the mountains!!! We loved it!! The cabin was exactly as pictured. We had s great time. Anything we needed or questioned Cabins USA responded in a timely, courteous manner. I will be back and I will book through this company. We just rented this cabin. Let me for warn anyone renting this.....the final stretch of roads up to this are DANGEROUS. It is ONE LANE , and the road is Twisty , with several hair pin curves, and you CANNOT SEE if anything is coming until it is Too Late. We were almost hit Twice by Construction Guys FLYING DOWN THE HILL after 5:pm. There are several cabins being bulit up here , due to the fires in this area. Cabins USA and the Owners need to address this before someone gets hurt or killed . We learned to BLOW OUR HORN as we drove to our cabin, and made sure we were back BEFORE DARK. This cabin is BRAND NEW as of June, and it's very beautiful. There is No Dining room area, only a small 2 seated pub table and the breakfast bar has 4 pub chairs ( might make it bad for small kids ). 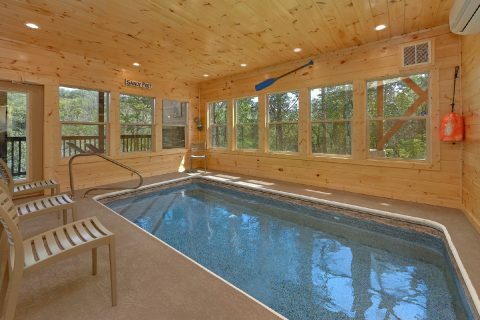 The pool is NOT HEATED, it is warmed by the ROOM ITSELF , by a heater on the upper wall that is controlled by a REMOTE. We rented this for the pool, and the water was TOO COLD because the heater is stuck on 76 degrees, and the remote was MISSING....no way to warm it. Maintenance was called and he came, and said YEP....too cold and Remote is gone, and never got us one, so we just used the hot tub at night. I informed CABINS USA and ask for our POOL FEE BACK, which they agreed to refund. Hopefully with this cool weather now the Remote is replaced for other renters. Also, it has a Charcoal Grill not GAS, and the grill is out in front on the side area of parking lot..... Definitely didn't like that. There was also a yellow 50 foot extension cord laying in the kitchen floor when we checked in. The maintenance man said previous tenant had issues with breakers shutting off in rooms, and this was used . Shouldn't of been laying out for us to trip over, and the issue should of been fixed before rented out again and cord removed. Again, cabin is VERY BEAUTIFUL. We had a wonderful time at this property! There was one problem. I am a cpap user. I slept in the main floor bedroom, or a least that was the plan. However, the breaker for that room must have been going bad. It kept switching of during the night. I ended up sleeping on the couch in the living room all three nights. Overall pleased with the cabin, the view and what's provided. Only things that could have made the stay, better. As we've stayed there 10 months ago and said the same, kitchen sink still leaks and have to find the correct weird angle to shut the water off from dripping all the time. The smell of urine from around the upstairs bathroom. The dehumidifier downstairs was not working and water was all over the floor from the humidity from pool. When walking on the tile was very slippery. As damage to the pool table and small arcade could happen. Not to mention mold in the wood cause of humidity. Not sure if the porch was built as a down slope or has just settled but the railing is unsafe and not attached on one side. Causing a major safety concern for small children. But other than that, it's a awesome place. That's why we've booked it twice in a years time. Folks would like to be warned of the road to the cabin I firmly believe if it had rained we would not have been able to make it to the cabin in our van. We did have a maintenance issue which the staff did address the day of the occurrence, however the tech did not show until 10:00 at night without any warning that he was coming. Thank you for taking the time to let us know about your recent stay in Scenic Mountain Pool. We here at Cabins USA work hard to make sure each of our guests have the best stay possible while vacationing in the Smokies. I apologize you were not notified our maintenance man was coming to your cabin. Your comments have been forwarded to our maintenance manager to be addressed. Thank you again for your review and thank you for choosing Cabins USA! Cabin was lovely with plenty of amenities. Loved the large hot tub pool. Only complaint is water coming from faucets it smelled of Sulphur and parking is tight. Thank you for taking the time to let us know about your recent stay in Scenic Mountain Pool! We here at Cabins USA work hard to make sure each of our guests have the same great stay you enjoyed while vacationing in the Smokies. Thank you for letting us know about the issue with the water. Your comments have been forwarded to maintenance to be addressed. When you are ready to stay with us again, please mention you are a return guest for an additional discount. Thank you again for your review and thank you for choosing Cabins USA! The cabin was lovely but the air conditioning did not cool the living/kitchen area in the 90 plus temperatures. The doorknob came off and Cabins USA responded almost immediately. The maintenance man was great. The location is a bit hard to get to and we were almost hit twice while coming in by cars coming out that were on our side of the road and traveling too fast. The front of our car was missed by inches on one occasion. Not everyone understands driving on winding country roads. Not Cabins USA's fault but important to know. Never rented a bad cabin from this company and they have always been clean. Thank you for taking the time to let us know about your recent stay in Scenic Mountain Pool. Our maintenance men work hard to ensure each of our guest's concerns are addressed as quickly as possible. Thank you for review and we look forward to having you as our guest again! we loved this cabin it was very clean and nicely furnished, the hot tub and swim spa were great , we liked the location short drive to pigeon forge . we cant wait to go back, staff was great too. I really enjoyed the cabin , and I will be back soon. I am happy to hear that you enjoyed your stay in Scenic Mountain Pool! When you are ready to stay with us again, please mention you are a return guest for an additional discount. Thank you for choosing Cabins USA and we look forward to seeing you again soon! Please note the letter below was sent on February 15th, the day after we returned from our trip and I have not had anyone respond. I am writing to express my disappointment in my recent trip to Tennessee and choosing to stay in a cabin managed by USA cabins. I have read my check-in paperwork and understand the disclosure about compensation related to things that can’t be controlled; however, I do believe proper maintenance of the key coded entry lock is a controllable issue. After checking in and arriving to my cabin, expecting a perfect weekend with my fiancée, I was not able to enter due to a faulty lock. I called the contact number several times, only to be on hold repeatedly by an automated system and then asked to leave a message, which I did. It is approximately 25 degrees, I have paid a lot of money to enter and find myself sitting in my vehicle waiting for an answer. In an attempt to reach anyone, my fiancée even sent a text to the checkout text number provided, to no avail. Finally, we decided to call the number back and select the option to make a reservation. Miraculously, a real live person answered the phone. It appears that if you haven’t spent money yet and are wanting to reserve a cabin, you are a priority worthy of someone actually answering the phone. The gentleman who answered changed the key code and again, it did not work. I was then placed on hold for 20 minutes and then was connected to Nikki, who again changed the key code, which also didn’t work. At 5:08pm, Nikki decided it would be best to send Maintenance, but stated it would be another 30 minutes before someone could arrive. At 5:37pm (please keep in mind we are still waiting in our vehicle…some start to our Valentine’s weekend) Doug, the maintenance technician showed up. He couldn’t get it open. We waited while he was on the phone trying to resolve the issue. At 5:58, Doug said go get something to eat and I will call you when it is fixed. Now, we have traveled 3 ½ hours to get to Tennessee and had planned to freshen up in our cabin before going to eat; however, given the situation and with our current appearance of a long trip, we grabbed fast food and waited for the call. Doug called at 6:24 and said he would have to leave the cabin unlocked until the lock could be fixed tomorrow. I failed to mention there was a car parked at our cabin when we arrived with Georgia license plates. Doug said he would text us about the car. We never received a text; however, when we were finally able to return, the car was gone. When we get up Saturday morning around 8:00am, we wanted to go and get some breakfast; however, both of us couldn’t leave because there was no way to lock the door and our possessions are now inside. I left my fiancée there and went to the grocery to grab some things to cook for our breakfast. While I was gone, Chris, another maintenance man, shows up to fix the lock. No warning of his arrival. If we would have known, we would have requested for him to come when I was there and not while my fiancée was at the cabin alone. Chris changes the lock on the door. My fiancée also tells him about having to take a shower with one of the track sliding doors open because it wouldn’t close and how when she attempted to close the door, the towel bar comes completely off. Chris repairs the track and says he will return after we check out to repair the towel bar. Chris was there approximately an hour and our trip did not plan for the additional company to our weekend. Another, minor disappointment, was the hot water level. The Master bedroom had a really neat heart-shaped tub; however, there was not enough hot water to fill the tub over the jets…really? That ended up being just a nice decoration…no real use. I totally understand Mother Nature creating some uncontrollable circumstances, but the lock issue should not have existed if appropriate monitoring/inspecting checks are made prior to taking someone’s money for the occupancy. I am anxiously awaiting your response before deciding how to post my review. I have one last added observation. Doug said that he checks the water in the pool rooms daily. I find that hard to believe, as he did not return while we were there to do a check and how could he have checked it prior to our arrival, if he couldn’t even enter either? Hmmm… something is just not adding up here. I’m not bashing any employee, as we were both spoken to in a professional manner; however, this was a controllable (to use your language) circumstance. Thank you for all of your kinds words! Our employees appreciate being recognized for their outstanding work. Everyone at Cabins USA work hard to make sure that each of our guests have the same great experience you enjoyed while vacationing in the Smokies. When you are ready to stay with us again, please let our reservationists know you are a return guest for an additional discount. Thank you again for your review and thank you for choosing Cabins USA!